Today, I meditated. And it was good. You see in my mind – I have some idealized notion that the best time for me to meditate (and I am talking about a 15-45 minute practice here) would be the first thing in the morning. 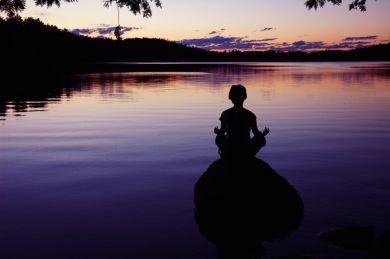 My thinking is, at this time of day – a meditation would serve to clear my brain for a peaceful and productive day. (Of course this is also the time of day I also want to squeeze in everything else, too – writing, exercising, etc. They all seem like they would work best first thing in the morning.) On an intuitive level – it makes sense to me – but on a practical level it just isn’t a good time for me. Maybe because I already spend quiet, reflective time most mornings; enjoying the birds in the yard, watching the early morning sky, sipping coffee contemplatively on my porch. Most days – it is a calm and “meditative” start to my day. And as my mind and body shake free of the sleepy cobwebs that cover my morning countenance – I quietly find myself attending to other simple morning rituals – breakfast, shower, putting away dishes and that sort of thing until it is time to begin work for the day. Making a list of projects, priorities and tasks, catching up on emails and then just getting down to the actual business of the day. It works for me – but try as I may – I just haven’t been able to squeeze meditation (or any of the other items) into my routine, on a regular basis. Also a departure from my meditation “norm”, today I found a lovely bit of meditation music to accompany the experience. You see, typically, I just sit quietly – but the addition of the music added a lovely, purposeful “sacredness” to the moment. And I discovered a cool website for downloading music for the mind, body and soul: http://mysoftmusic.com/new. Good stuff. I chose a piece that was just the right length of time, I was clear about the visualization I wanted to use in my mind and I just went for it. And it was particularly sweet. Ommmmm… Ahhhhh… And afterwards? Afterwards I felt clear, and calm and centered and quite simply – I just felt really good. And the experience has propelled me through the rest of my day. For me, it feels like I accomplished something – which of course I did AND it is ironic when you think about – because that something – was sitting quietly and “doing nothing”. But the paradoxical nature of meditation and its effects are part of what I like about it. (A quick search on the internet will pull up numerous examples of how meditation benefits its practitioners on a multitude of levels, but I am not going to delve into that here.) Now, I don’t know if this is going to be the “new normal” – but I can certainly see how it might work for me to make it – just that. It’s fitting really when one contemplates the meaning of mindfulness – to allow myself to meditate rather than to attempt to force it into a schedule.